The Saudization Effect: how does Nitaqat impact the Saudi Arabian property market? Cinema is a magic world; anything can look 10 times better or 10 times worse in movies; all according to the movie makers’ choice. Cinematic lighting and décor have the ability to make places look magical and beautiful if so the director chooses. And some of these beautiful places live long in cinema history. Some famous houses from the movie world are simply too iconic to forget. Even though some of them are movie sets and not even real houses, they are still a dream home for many people. So which of these famous houses is your dream home? One of the most iconic movie houses that are in fact real houses, this movie house exemplifies Christmas for most people. The exterior and the colorful décor simply says the holiday season is here. The house was the main set for the blockbuster Home Alone. It was also used in the sequel Home Alone 2, albeit not the main setting. 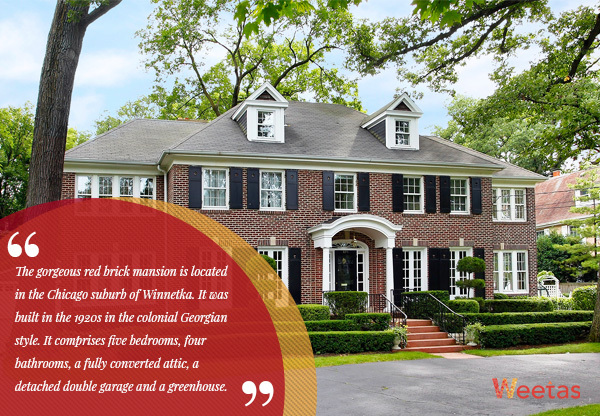 The gorgeous red brick mansion is located in the Chicago suburb of Winnetka. It was built in the 1920s in the colonial Georgian style. It comprises five bedrooms, four bathrooms, a fully converted attic, a detached double garage and a greenhouse. The kitchen, the main staircase, basement, attic and most of the first floor landing in the film were shot in the house. However some other rooms had to be duplicated in a movie set for more maneuvering room. 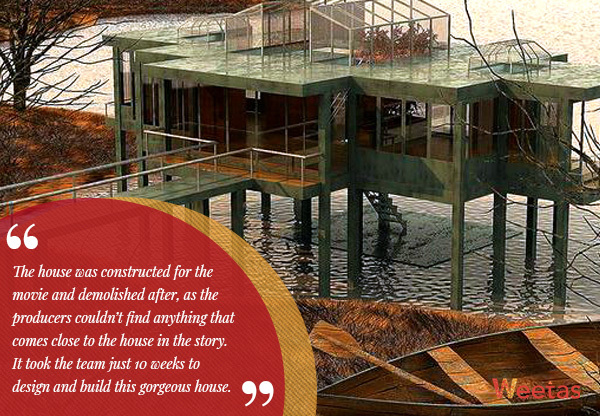 Too bad this utterly breathtaking house is not a real house; it is a dream home for many people. In the movie, a love story revolves around the house, which makes a perfect backdrop for romance. The house was constructed for the movie and demolished after, as the producers couldn’t find anything that comes close to the house in the story. It took the team just 10 weeks to design and build this gorgeous house. It was built on Maple Lake in Willow Springs, Illinois, with glass walls and a Maple tree right in the center of the house. Initially, the glass house was constructed on dry land right next to the lake, lifted on steel beams 10 feet above the waterline. After the construction was over, the building team excavated the soil under it to allow lake waters to flood under the pilings. One of the most famous houses in cinema, this charming beach house with its iconic blue shutters is in fact a real house. Good news for best-selling author Nicolas Sparks’ fans! 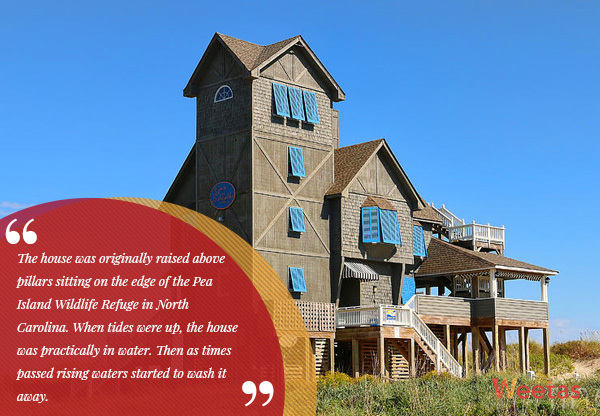 The house was originally raised above pillars sitting on the edge of the Pea Island Wildlife Refuge in North Carolina. When tides were up, the house was practically in water. Then as times passed rising waters started to wash it away. But the house, called Serendipity, was thankfully purchased, moved and restored by a couple who loved the movie. They have recreated the famous Inn from the novel and turned it into a vacation rental. It has been welcoming visitors since. 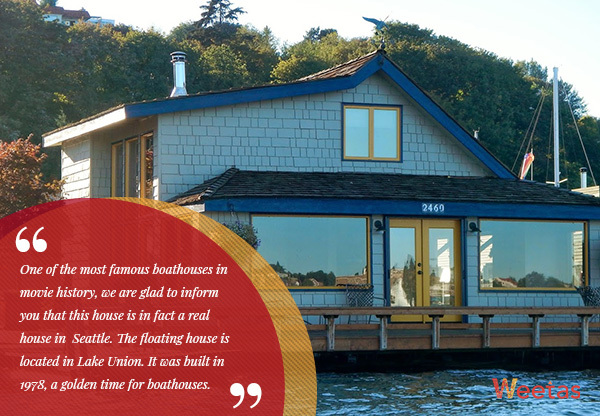 One of the most famous boathouses in movie history, we are glad to inform you that this house is in fact a real house in Seattle. The floating house is located in Lake Union. It was built in 1978, a golden time for boathouses. With an area of 2,000 square feet, the house comprises four bedrooms and two bathrooms. Only the exterior of the house and the stunning surroundings, including the wooden bench overlooking the water, were actually used to film though. The interior shots were all taken in a movie set. 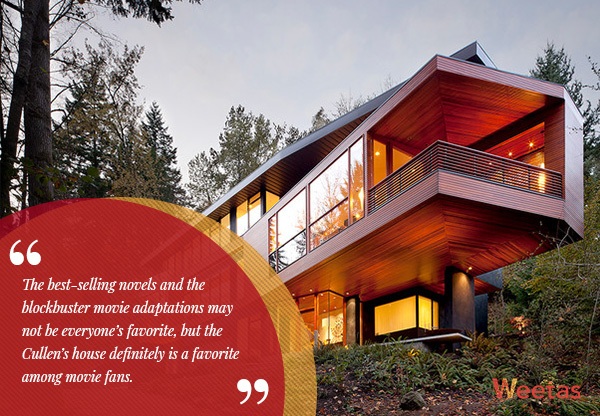 The best-selling novels and the blockbuster movie adaptations may not be everyone’s favorite, but the Cullen’s house definitely is a favorite among movie fans. The story calls for a wonderfully luxurious house in the middle of the woods, and the house used for filming , which we are glad to report is a real house, certainly delivers. The house is built with natural materials, it sits amidst a lush forest and features magnificent glass walls the show the surrounding greenery and impressively tall trees. The house may be famous but it is a private property; it was built in 2006 for John Hoke, a director of footwear design in Nike.